Those Full-Body Scanners We Were Told Wouldn't Save Images? Yeah, They're Saving Images. Shock. Who saw this coming? Oh, right: most everyone. Gotcha. The Federal Government has admitted to storing those full-body scan images that had privacy advocates so worked up over the past few months. This, despite the fact that it said it wouldn’t store the images. Say one thing, do another. Yay. Even more annoying is the fact that these full-body scanning machines were sold to us as not even being able to store images at all! As if there was no memory for the pictures to go after they had been taken. Clearly we have been misled. Does this all ring a bell? 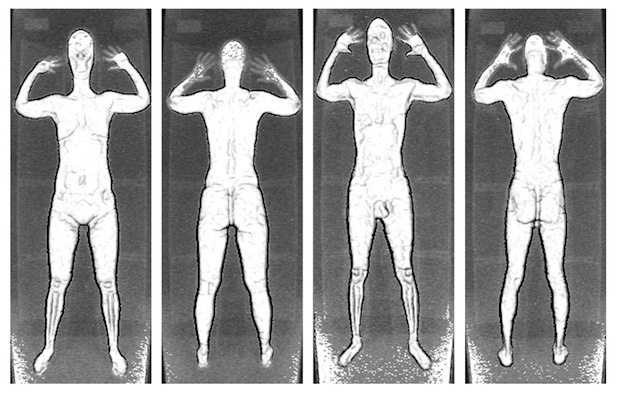 The full-body scanners, we’ve been told, are a safe, secure way to check out whether or not someone is trying to carry contraband on-board an airplane. (Well, it’s quick than a traditional pat-down.) We were told that the scanning process would be split into two: the person hitting the “scan” button, and the person in a separate room actually analyzing the photo. That way the person doing the analyzing doesn’t actually know what the person in the photo looks like. I didn’t mind the scanners in the beginning, but I’m not a fan of being misled to.